What is task management, why it's important, and how it's done. Useful tools for managing and tracking project tasks. Merci! S'il vous plaît vérifier votre email pour le lien de téléchargement et des conseils pour commencer. Task management forms the foundation of the project management discipline. Done right, it provides organizations with an efficient workflow process that becomes the core vehicle for delivering all of their projects. Managing tasks is not easy, but, with a proper system in place and the right task tracking tools, professionals can ensure their projects run smoothly from beginning to end. On this page, we will run you through the basics of task management, from definition, importance and methodologies, to free task manager apps and tools for organizing and tracking project tasks. Read the full guide or use the links below to jump straight to the chapter you're interested in. 2. Why is task management important? 3. How do task management and project management differ? Tasks are all of the work items and assignments that need to be accomplished within a defined amount of time for a project to be completed. Project management teams are chartered with effectively managing these tasks throughout the duration of a project. This often requires coordination with other teams and people, as well as orchestration of all preceding and upcoming tasks. Project managers create Gantt charts to help manage tasks. Each task has a title or description, a start date and an end date, and it can also include details such as task owner or percentage complete. Usually, the tasks are placed in order on the Gantt chart, based on which activity needs to be completed before others can begin. Task management is the practice of managing a series of tasks to completion, as defined by a project schedule. It is the process of progressing each task through its full life cycle, from the creation phase all the way through to completion and reporting. Project managers follow systematic task management processes to manage all aspects of tasks. These processes include task assignment, timelines, prioritization, budgeting, and status communications, among others. Why is task management important? When working with teams, proper task management is key to productivity and harmony in the workplace. It provides structure and clarity, giving everyone a detailed view on all the moving parts of a project and how they fit together. Good task management practices and tools will help team members know their priorities at all times, stay in sync, and keep a balanced workload, enabling them to hit their deadlines successfully. Above all, knowing exactly what needs to be done, by when, and in what order will also reduce anxiety and stress levels in the workplace. 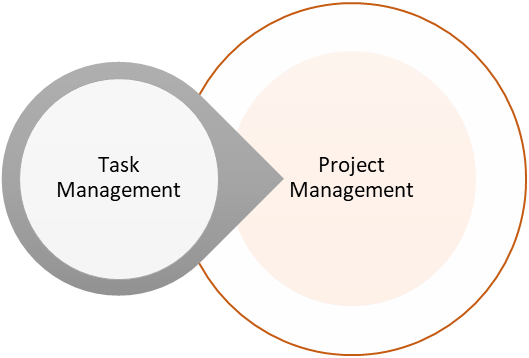 How do task management and project management differ? Task management is closely related to – and is part of – project management. This is why the two concepts can be easily confused. However, task management is not a substitute for project management, and there are significant differences between the former and the latter. Task management can be a short-term, long-term or permanent process. It entails using specific techniques, tools and software to break down organizational or project goals into tasks, assign deadlines and team members, and monitor the progress. Project management, on the other hand, does not involve permanent aspects of business. It is a temporary process that always has a completion date and very precise success criteria – a service, product or feature with a defined beginning and end, and delivered within a specific budget. While task management oversees only task-related aspects, project management encompasses every single detail that has any touch point with a project, including strategic planning, budgeting, resource management, documentation, and, of course, managing and tracking tasks. There are several major approaches to managing a team's tasks. While many of the popular methods were designed for software development projects, they can be applied successfully in other fields as well. In fact, they may be some of the most efficient techniques, because they were conceived by professionals who desperately needed to work fast, stay organized, and deliver on time. Below are a few commonly-used task management systems explained. One of the more traditional task management methodologies, waterfall is a linear approach that requires extensive planning. Tasks are defined in full up front and then executed in sequence, with each phase having to be completed before the next one can begin. With work carefully planned and delivered in a single cycle, the waterfall system has the advantage of being predictable and very straightforward, but it doesn't provide much flexibility. This is why it's best fitted for large projects that require keeping strict deadlines or for repetitive activities that have little chances of surprising you along the way. With Agile, teams cycle through processes of planning, execution and evaluation as they go along. Project tasks are conceived and adjusted as the situation demands, rather than having everything set in stone from the start as in the Waterfall system. This makes Agile best suited for incremental projects or goals that have a higher level of unpredictability and complexity. A form of Agile task management, Scrum advocates empowering a small, self-organizing team to define roles and responsibilities and prioritize tasks. In Scrum, there are fixed-length iterations known as sprints that last for one or two weeks, at the end of which the team needs to deliver specific segments of the project and plan for the next iteration. This task management method provides flexibility and enables the team to gain a clear insight into the status of the project, allowing them to accurately judge roadblocks that may hold them back. However, there are high chances of failure if not all individuals inside the team are experienced enough, cooperative, and committed to the work. Quite similar to Scrum, Kanban focuses on self-managing teams and early releases. Lighter on processes, Kanban is visual and flexible, doesn't have prescribed roles, and aims to improve output by increasing the team's focus on tasks that really matter. The system is ideal for smaller teams working in contexts where task priorities can change often – for instance, maintenance or operational environments. Cards are moved through these columns as work on tasks progresses, painting a clear picture of the workflow process and allowing everyone to see what's coming up next. This makes it easy to reprioritize, limit work in progress, prevent stalling, and uncover problems early on. Collect absolutely all tasks that need to get done at any point, adding more tasks to the list the moment they come in. Clarify and organize the tasks. What isn't actionable will be moved to a "Trash" list, while what can be done in under two minutes should be done right away. Whatever tasks take longer will be prioritized and scheduled, and those that require multiple actions will be broken down into smaller, easier to manage pieces. Review often. Setting aside time to review and update the task lists at least once a week is key to the effectiveness of the system. Engage. Choose your next task and get to action. The system should make this easy, as the tasks are categorized, prioritized, and broken into small chunks that are easy to start. 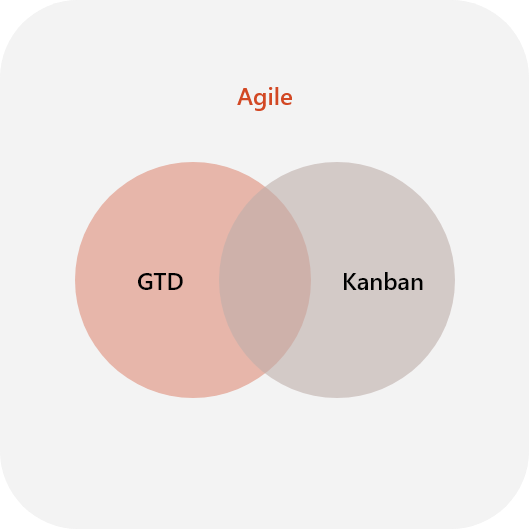 Although originally intended for individual task management, GTD can work successfully in team environments as well. It will provide a common "language" and set of principles to the whole team, while allowing members to implement those principles in a way that works best for them. What task management system should you choose? Choosing a task management method depends on a variety of factors, from the complexity of the work, flexibility of the timeline, and the stakeholders' involvement, to the team's size, culture, and even aversion to change. Usually, to find the right fit, managers don't make the decision on their own - they collaborate with the team members to select the approach that would bring the the most benefits to everyone. The Agile principles can be used as a general mindset for progressing quickly. GTD can be applied for defining, organizing and prioritizing tasks. Kanban can be used as a way to visualize and track the tasks. 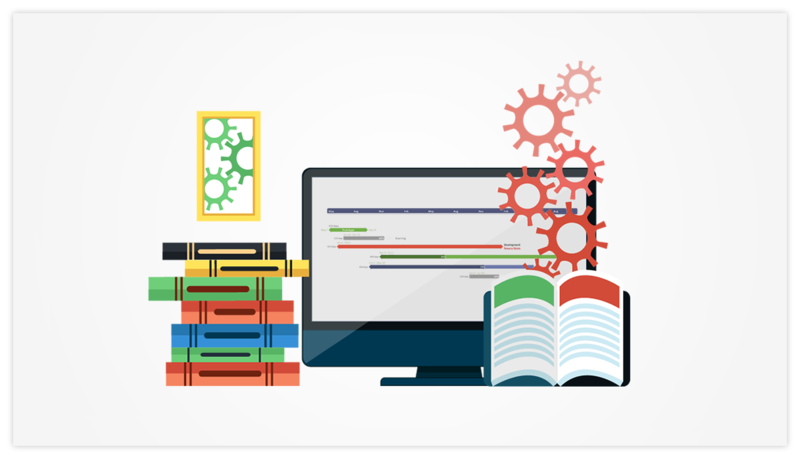 From simple spreadsheet templates to complex task management software, there are a variety of resources available that can help professionals manage tasks more easily. Below we'll take a quick look at them and provide a few free task tracking tools professionals might find useful. Easy to document and consistent, task management templates can help save time and replicate work quickly for regular reviews and reports. Usually created for popular office tools such as Excel or PowerPoint, they are familiar to everyone and don't require learning new software to maintain them. The drawback of templates is that, in the case of large and complex projects, they can become challenging to update. In such cases, an option would be to import them into simple task tracker apps or task management tools that support such integrations and update them there. Professionals working on small to mid-sized projects can find useful Excel and PowerPoint templates in our free task management template gallery. The Excel spreadsheets include formulas and simple charts to automate task planning and tracking, while the PowerPoint slides are designed to be visual and easy to follow, suitable for communications to high-level audiences. Providing more versatility and automation than templates, well-chosen task management software can improve productivity and help team members and stakeholders stay on the same page. The variety of task trackers available on the market today ranges from simple list-based tools to robust applications for handling large projects delivered by dispersed teams. It includes online task manager software, collaboration and notification-based tools, visualization tools and a number of simpler free task manager apps. In evaluating task management tools, users should first assess the size and complexity of their project. Simpler projects with small teams may find enterprise project management software too complex, while teams working on massive projects will most probably find simple to-do-list tools unusable. 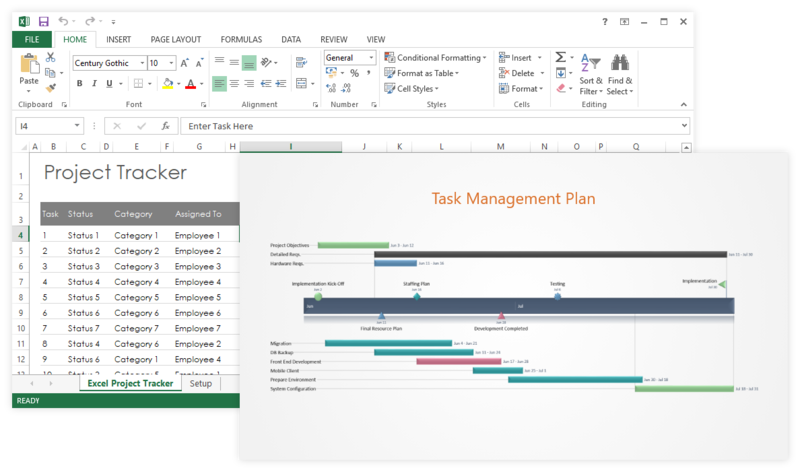 Those looking for the middle ground can try Office Timeline's lightweight task manager for PowerPoint. It is a free add-in that automatically turns raw task data into simple-to-understand Gantt charts and timelines, enabling users to easily organize, track and update their tasks. Additionally, the task tracker can import schedules from existing Excel files, and it also has a web-based version for those who prefer to manage their tasks online. Directing an individual or team of people to execute and complete a task within a specific time period. A task visualization tool that helps project managers and teams track the progress of their tasks toward completion. A result of the Work Break Down Process (WBS) where the activities required to deliver a project are defined. A relationship between tasks where one task is dependent upon the completion of a preceding task before it can begin. A project planner’s estimation of the time and budget required to complete a task. Messages from task manager apps that inform project participants of task status changes and deadlines. Ranking which tasks to do first based on constraints such as time, resources and other dependencies. The recurring communication of a task’s status to a project manager. The chronological listing of all tasks by start date, which is visually represented on a timeline or Gantt chart. Tasks that are dependent on completion of a preceding task are scheduled with a connection to that preceding task. The graphical presentation of a project’s tasks, most often prepared using task management software. Office Timeline is an award winning task management tool for PowerPoint.